Seeing as I’m 28 and have no children, it’s not too often that I see children’s movies nowadays. I certainly enjoy many of the Pixar films and other similar computer-animated films, but I don’t think I’ve seen a G- or PG-rated live-action film in quite a while. In fact, I think the last live-action family film I’d seen was Elf. 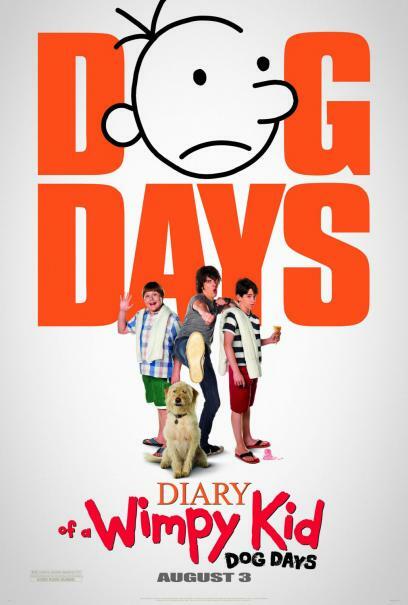 Going into Diary of a Wimpy Kid: Dog Days, I decided to temper my expectations. I knew it was based on some children’s books, so I figured it’d be a light-hearted comedy full of slapstick humor and awkward situations. As it is, I was pretty much right on the button, but that isn’t necessarily a bad thing. Some clever dialogue and surprisingly poignant moments spark what could have been an otherwise mediocre film. It’s the last day of school and Greg Heffley (Zachary Gordon) is stoked for the summer to begin. He’s looking forward to playing video games and hopefully hanging out with Holly (Peyton List), a classmate on whom he’s developed a moderate crush. But before she can give him her phone number, she’s whisked away by her friends and he’s stuck trying to figure out ways to hang out with her. At the same time, he has to figure out how to appease his dad Frank (Steve Zahn), who wants him to be more active outside, and his mom Susan (Rachael Harris), who wants him to be a part of a summer reading club. To pursue this avenue, Frank enrolls Greg in the Wilderness Explorers in the very troop he was in as a child. Meanwhile, his best friend Rowley (Robert Capron) invites him to the country club his family are members of, and it just so happens Holly is a tennis instructor there. Once Greg discovers this, he pretends to get a job there to appease his parents and so he can continue to hang out at the country club and try and woo his ladyfriend. Similarly, his older brother Rodrick (Devon Bostick) is trying to woo Holly’s older sister (Melissa Roxburgh), who also works at the country club, so he forces Greg to sneak him in. As one can imagine, there are a lot of hijinks involved as well as situational humor. Greg finds himself in various predicaments and always somehow seems to get in trouble. The kids in the theater apparently found it very humorous. I thought it was pretty predictable, as literally EVERY endeavor Greg and Rowley pursue ends up in trouble for them. Still, it’s meant to be a funny movie for kids, and they thought it was funny, so I guess I can’t really dock it that much. I was actually pleasantly surprised in a few parts. The children’s book is animated with simple stick figures, and many of the segues feature entertaining, at times hilarious, little animated cutscenes. I found myself enjoying these as much as the movie itself. Gordon, List, and Capron all work together well, and Laine MacNeil is pretty funny as one of the film’s antagonist. Zahn and Harris are kinda stiff as Greg’s parents, but they get the job done. There’s also a surprisingly poignant scene towards the end after one of Greg’s little mishaps. Frank sits him down after Greg owned up to his mistake in front of everyone and said just how proud he was of him, telling him, “A man who never made a mistake, never made anything.” It was a genuinely touching moment that can be applied to adults as well as children, and it caught me off guard. All in all, Dog Days probably won’t be winning too many awards, but there aren’t any major flaws. I kinda question its timing, as it’s meant to chronicle the summer of a seventh grader, but it’s being released a few weeks before kids are getting ready to head back to school. Still, it’s entertaining enough that it should be a solid getaway for the family for a couple of hours. 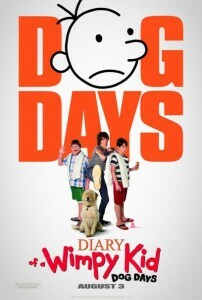 Diary of a Wimpy Kid: Dog Days gets a B-.